Insiya Rasiwala-Finn B.A., E-RYT, Ayurvedic Health Counsellor; is a yogini and writer from Bombay, India. Since 2006, Insiya has been on a radical journey of self-healing, simplicity and exploration; sharing her insights as a yogi, a woman and a mother through writing and teaching. 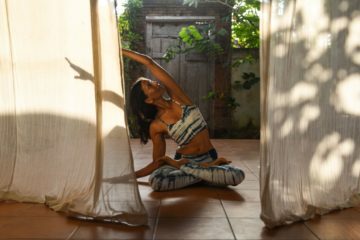 Insiya is known for her lyrical, heart filled yet challenging vinyasa practice; a first-person, East-West perspective in her teachings; and the ability to make the ancient wisdom of Vedic India relevant, contemporary and alive. Insiya has been featured in Yoga Journal and Peppermint magazines, has written on wellness for the Globe + Mail; and presents internationally at festivals such as Wanderlust.